When I was organizing my NeedlePointer’s magazines, I couldn’t resist thumbing through them and I found Jean Hilton’s Diamond Bargello design. It is in the April/May 1996, volume XXIV, No. 3 issue. I modified the design to fit the 4″ x 4″ space for this set of bookends. It was originally an 8″ x 12″ design. What I especially liked about the design for the bookends was how the motion of the pattern pushes the books together. 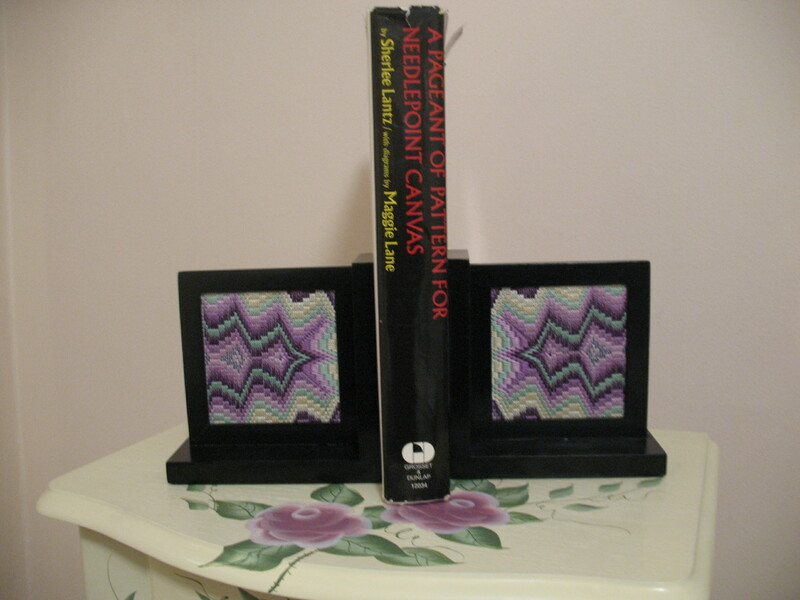 Speaking of books, I used A Pageant of Pattern for Needlepoint Canvas by Sherlee Lantz with diagrams by Maggie Lane to showcase the bookends. I am surprised by the variety of prices for this book on various sites. It ranges from $10 to $288 (I got mine used for $4). I do like the diagrams but what I really like are the historical notes associated with some of the patterns. Most are adapted or re-interpreted from photographed needlework but some stitch patterns are invented by the author and she clearly notes this distinction.